As July draws to a close I must note the 125th anniversary of the Foran murder in County Kerry. 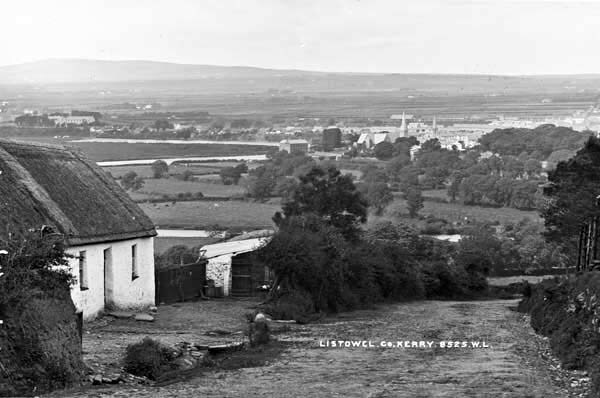 Late 19th century view of countryside near Listowel. Knocanore Hill in the background. John Foran, about 60, leased a farm in Coolaclarig townland, three miles north of Listowel on the east side of Knocanore Hill. He was ambushed on a Sunday afternoon, shot six times by an assassin who emerged from the woods at the side of the road. The murder was witnessed by his 15-year-old son and three hired laborers who were traveling with Foran in a horse cart on the way home from Tralee. “The circumstances in connection with it are undoubtedly of a most appalling character and would leave one to fancy we were living in the medieval ages, among a tribe of barbarians, rather than in this nineteenth century, among a civilised [cq] and Christian people,” the Sentinel said. The murder also was reported in other Irish papers, as well as publications in England, Australia and the United States. Foran had been boycotted by his neighbors for several years after taking over the lease to the Coolaclarig farm from the previous tenant, who was evicted after falling behind in his rent to the absentee English landlord. Foran was a victim of “agrarian outrage,” a euphemism for violence associated with the land struggles of the period. His was the second such murder in north Kerry that year, and both killings would become grist in subsequent Parliamentary elections. A man was arrested, charged and put on trial for Foran’s murder that fall. The victim’s son gave conflicting testimony about his identification of the accused. The three laborers said the couldn’t identify the shooter. “Too much smoke,” they claimed. The Crown dropped the case in early 1889. The case became fodder for political pamphlets in the 1891 Parliamentary elections, and continued to be discussed at Westminster over the next 20 years. The evicted tenant was eventually restored to the property, even given a grant to buy cows and other supplies. Nora Foran Scanlon, one of the victim’s daughters living in Pittsburgh, wrote to British and Irish Free State government officials requesting return of the farm or financial relief as late as 1925. In the letters, she also attempted to use the death of her eldest son in World War I as further justification for some type of compensation. Her pleas were rejected. The Foran case illustrates a number of social and political realities of the period. My research continues. Anyone with additional information please contact me through the blog. This entry was posted in History and tagged agrarian outrage, County Kerry, John Foran on July 31, 2013 by admin.